Pushing Madness brings your Lisen of Solsta series to a close. The series took many years to write. Was this an emotional book for you to write? I was so focused on finishing the damn thing that I didn’t have a chance to get emotional. Writing it in concert with the previous book (Breaking Worlds) meant I wrote 200K words before I could call it done in first draft. So when I came back to Pushing Madness after publishing Breaking Worlds, it felt both new and old to me. On the other hand, there’s this which I wrote in the “About the Author” section for Blooded, book 3 in the series. “The other thing I’d accomplished [on completing the first trilogy], though I hadn’t set it as a goal, was to show a hero saying ‘let’s not fight; let’s find another way to work it out,’ thus ending a war before it got beyond its first day.” This time out with book 6, Lisen couldn’t end the war the easy way. The easy way had led to dire consequences, and those consequences played out to their ultimate degree in Pushing Madness. I saw only one way to end it–a sad and unfortunate way to end it–so I did it. But unlike the feelings ending Blooded brought out, I felt relief, relief that I could get up and walk away. It was long past time, and I was grateful. Who were some important people in your life that helped you write this book and series? Well, there was my canary in the mine, Daniella, who never failed to ask the precisely right, simple question when I would orally outline what was coming next to her. She was the only person I shared the raw thought process with, and she, in turn, gave me valuable feedback–questions like “how does Nalin feel about that?” when I was contemplating a story I never ended up telling. Simple question, story-devastating answer. I also turned to friends for encouragement when I fell into the abyss of I’ll-never-get-this-right. One friend constantly points out, “You’ll figure out,” and that has become a bit of a joke between us. Because it’s true; I always do figure it out. Also the writers in the workshop I attend weekly have done nothing but support me and question every possible misstep. I highly recommend a critique group to anyone who wants to write. You can never fool your peers, and if they’re gentle the way the writers in my group are, they are a true blessing. A friend I met on line and who lives on another continent offers her best to any of my endeavors. And finally my sister, who writes better than I do and offers critique and love for free. We finally get to see what happens to Rinli and Lisen. Was this planned all along or did things change as you were writing the series? Lisen’s journey always stretched out to at least the moment Rinli comes of age, but it was a very different story with a very different ending. As I’ve said before, Breaking Worlds and Pushing Madness were written together in response to the question “what does a world broken by Mantar’s Child look like?” 200K words later, I had the answer. But that answer did not come easily. There were many starts and stops along the way. In particular, Rinli’s motivation of the people of Thristas was tricky and required several retakes before it flew properly. 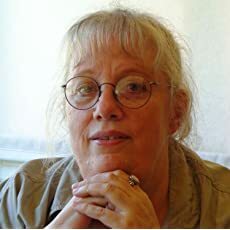 I usually write with a beginning and an end in mind, and I thought I knew the ending when I started writing the first draft of the two books, but it changed several times. Lin-Manual Miranda’s words from Hamilton come to mind: “Who lives, Who dies, Who tells your story?” I may have been telling the story, but for a long time I didn’t know who lived and who died. Will this be the end of the Lisen of Solsta world? Are you moving on to other works or do you think you will revisit this world again? Return for one last visit to Garla and Thristas where the Thristans follow an untried leader of sixteen into war. Where a spouse and a daughter must each withhold their plans from the man whose thoughts could betray them. 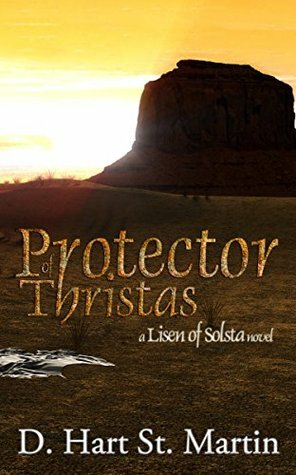 Where a girl of twelve may rise up to meet the challenge of trying to save her mother. Where magic sometimes exacts a price that could prove to be deadly. 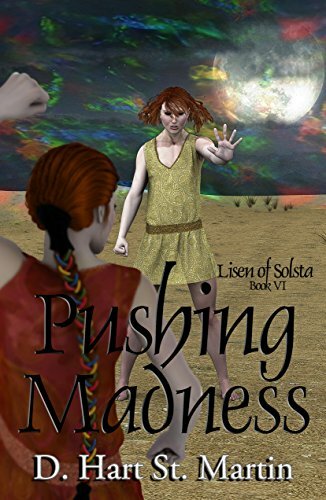 Pushing Madness brings Lisen of Solsta’s saga to a close with battles waged in both Garla and Thristas using weapons of war and the defenses of the mind. Lisen’s daughter Rinli has vowed to “break the world,” and the havoc that ensues as she endeavors to fulfill that promise could obliterate the peace Lisen instituted sixteen years earlier with the Treaty of the One-Day War. Only one opportunity remains to avoid destruction, and it all rests in the hands of a twelve-year-out girl.